Provides substantial savings from buying product in bulk. Significantly less cost than stainless steel vessel. Features include a knockdown frame for easy assembly and relocation. Can be customized for specific applications with various options for material handling and conveying. Application specific bag dumping stations are custom designed. Stations can be fabricated in carbon steel or stainless steel with sanitary specific designs. Options include self contained cartridge type dust collector, exhaust fan for dust free environment, clean-out doors, removable grating. Also, discharge devices can be added such as butterfly valves, rotary valves, screw conveyors, volumetric feeders or vacuum take-away assemblies. Available pre-fabricated or assembled on site. The simple, reliable design of our vacuum/pressure filter receiver provides efficient separation of the material and air/gas streams in vacuum or pressure pneumatic conveying systems. 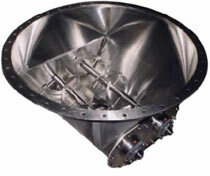 Heavy duty cylindrical shell is designed to withstand up to 14 PSIG / 15” HG vacuum. No interruption of the filter receiver’s operation because each row of filter cartridges is cleaned individually. Carbon steel, aluminum or stainless steel construction available. 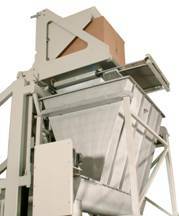 Silo bottom and hopper bottom lump breaker, available for bulk bag applications. The unit center feeds the product while breaking up lumps handling difficult materials. Also known as lift and seal tote and drum dumpers. Safely raise and unload bulk materials from floor level into elevated storage bins or process equipment. Completely automated container discharger material processing systems are available and provide increased throughput and productivity; improved system controls integration and reduced operating costs through savings in direct labor and material losses due to spillage, incomplete container discharge, and foreign material contamination. Open bucket container dischargers provide economical solutions for unloading non-dust-generating materials from any type of bin, box, drum or tote. Alternately, our sealed and enclosed container dischargers meet the most stringent dust control requirements. Furthermore, hydraulic sealed container dischargers eliminate the problem of foreign material contamination from pallets or containers getting into the downstream process. Our Agitator Hoppers are designed specifically for trouble-free dispensing of non free-flowing materials, without bridging or ratholing. The handling and discharge of difficult materials are made possible by the proper combinations of features such as the steep angle of the hopper sides and continuous welds on inside seams to prevent material from catching or accumulating. The agitator sweep arms are angled and strategically placed to keep material moving into the discharge trough. The discharge trough covers the entire hopper base, further eliminating bridging and hang-ups. Various take-away systems and arrangements are available.